Is the Abbott government bored or panicked? It’s hard to tell. Here’s the case for bored: they’ve done everything they promised to do and they hate the idea of a government who actually does stuff so they’ve got no idea what to actually do. There’s nothing on the agenda. Literally. In my professional experience, when you have a committee that meets regularly and gets to a point where there’s nothing on the agenda, there is usually a consensus acceptance that the committee has run its course and can be disbanded. What’s the point of meetings without agendas? That’s what the Abbott government is finding their whole government has become. A meeting without an agenda. When they were elected, they promised to ditch the Carbon Price, axe the mining tax and stop the boats. And presumably, having done all of this (well, if you count stopping the boats as just not telling us about the boats), they’re now devoid of a purpose. Of course there is no narrative, because there are no ideas. Stories don’t exist without at least a ‘once upon a time…’. And there sure isn’t a ‘…happily live ever after’ with these morons in charge. They don’t want to reform, they just want to wreck. Much of their wrecking is being blocked, thank fully, by the Senate, so the wrecking ball hangs idle and there’s no future plans going into or coming out of Credlin’s office. A small, ineffectual government is boring. Being in government when you don’t actually like the idea of government is sort of like having a car but not having any interest in learning to drive it. You can sit in it in your driveway, you can wash it and admire it and use it to make yourself feel good about yourself. But you can’t do anything with it. It’s boring. Hence why this week Dutton, ex-policeman and current-potato-head was presumably responsible for the latest farce: Border Farce. The scare machine has got boring; no one cares about the ‘death cult’ anymore and the promises to bomb Syria are not having the desired effect of persuading Australians to back a war. Wars are a good way to pass the time in government, and to whip up fear, but when the electorate is just ‘meh’ about the whole thing, it’s no wonder Dutton and Abbott are keen to flick the idea around of perhaps having a civil war. Checking visas in the street is a good way to divide the masses into those who belong in Team Australia and those who don’t. It’s just a game to these crazy cats. So, like a child who has many books, but hasn’t learned to read them, who has the attention span of a flea and has smashed up all their toys so they don’t work anymore, the Abbott government is so bored they’re playing games, fighting amongst themselves and are taking expensive helicopter rides to party fundraisers because, frankly, they have nothing better to do. Here’s the case for panicked: the Canning by-election polls. People’s jobs are on the line. Not just jobs, obviously, but salaries and, shock horror, entitlements. The panic must be worsening every time they see another poll, and they realise that the Canning by-election swing, if played out across the country, puts many of them in the unemployment queue come the next election. That’s when it becomes every blue-tie-wearing man (and a few women) for themselves. That’s when Joe Hockey decides he’s interested in the Republic Movement for its two advantages of being a potential poll boost for him personally, and to differentiate him against Monarchist Abbott. Panicked is when there are slogans without policies and they can’t even get the three words in the right order (Jobs and Growth, Growth and Jobs, Jobs and Jobs, Growth and Growth, Green Eggs and Ham, I do not like them here or there, I do not like them anywhere). Panic is when talking points reminding people not to leak are immediately leaked, and then there are leaks about the displeasure Abbott has had in learning of leaks. Leaking from every pore is a sure sign that the government is a dysfunctional, disunited, chaotic train wreck. That’s what they said about Labor wasn’t it? That’s what they are. They don’t care about the economy, they don’t care about people out there in their electorates losing their jobs, they don’t care if climate change is getting worse and there’s no plan to address the health and education needs of the community, there’s no infrastructure plan, there’s no jobs plan, there’s no growth plan. There are anti-Labor-attack-ads being produced. There is a Royal Commission into Trade Unions (designed to destroy the Labor Party) which has descended into comedy. There is a delusional hatred of wind farms. And of course there’s a violent-gun-nut change to gun laws to bring back deadly weapons. But there is no plan. There is just panic. So I think I’ve answered my question. Clearly there is an eerie mixture of both: the Abbott government is both bored and panicked. Every day is a new day ready to stuff things up. Amusing to watch, I must admit. 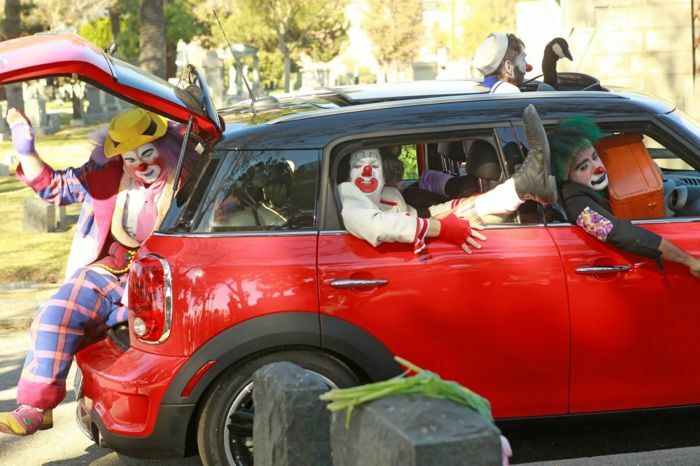 Like a slow motion car-crash, and the car is packed full of clowns doped up on valium. Someone pass the popcorn! They lurch from one disaster to the next .. Just when you think they cannot become any more ridiculous ……..they do! It must be time for Murdock to step in and give Abbott a new job list.